You are here: Home / Book Reviews & Recommendations / Great Big Ideas that will make you excited for the latest Hamster Princess Book: Giant Trouble! Harriet Hamsterbone doesn’t go looking for trouble. Somehow it always finds her. So she isn’t completely shocked when a salesman attempts to sell her some magic beans, or when one of those beans grows into a towering beanstalk leading up into the clouds. But even Harriet is surprised to find a giant castle–complete with one very poetically challenged giant– at the top of it. And she certainly never thought she would make a new friend named Strings who is half harp, half hamster. But Strings isn’t the giant’s guest–she and a rather large goose are his prisoners! This calls for a heroic rescue, and Harriet is just the hamster for the job. I haven’t read much of the series, but I find Harriet absolutely endearing. She’s princess enough for my girly girls, but spunky enough to capture that side of them as well. She’s brave and adventurous, if just a little bit mischievous. I think it’s no wonder that many girls in my daughters’ class love her, even though they are each as different as you might expect. I always enjoy activities that we can do as a family, or even those my children can do on their own, that capture their creativity… without much prep. I’m no stranger to pinning a hundred of the world’s cutest crafts and educational activities, but let’s be honest. I don’t usually get to the craft store with a list in hand to prepare for all of the creative whims my kids may go on in a given week. So for you, I’ve rounded up some adorable “Hamster Princess” and/or “[Hero(ine)] and the Beanstalk” activities that won’t require so much prep or cleanup that nobody actually enjoys doing them when all is said and done. And if your kiddos are anything like mine, they’ll love the open-ended play that they provide! Or how about this giant, floor-to-ceiling beanstalk made out of paper? And there’s the always-fun option to grow your own “beanstalk”… though I’m not sure it will reach all the way to the clouds. We’ve never had quite that much luck with ours! Oh, yeah. Free books, anyone?! In honor of the book’s release this week, I’m joining with other bloggers and with Penguin kids to give away some free Harriet books! 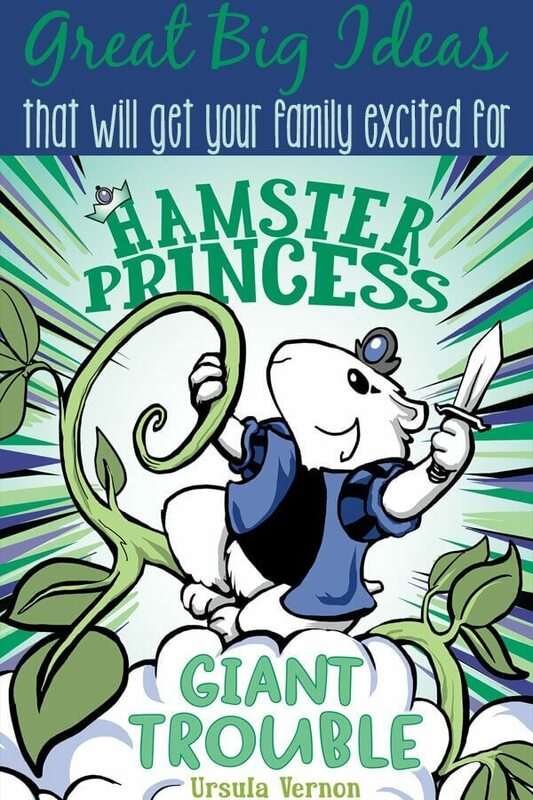 Enter for a chance to be one (1) grand prize winner and receive a set of Hamster Princess books, including Harriet the Invincible, Of Mice and Magic, Ratpunzel, and Giant Trouble (ARV: $51.96), or to be one of five (5) second prize winners to receive Hamster Princess: Harriet the Invincible (ARV: $12.99 each). NO PURCHASE NECESSARY. Enter between 12:00am EST on May 8, 2017 and 12:00am EST on May 15, 2017. Open to residents of the fifty United States and the Distric of Columbia who are 13 and older. Winners will be selected at random on or about May 18, 2017. Odds of winning depend on number of eligible entries received. Void where prohibited or restricted by law. Very excited to find these books for my girls! Not sure what is meant by “Share your thoughts on today’s post from the blog tour!”. Cute book though! This would wonderful to read to my niece! Yes!! My granddaughters would love this books!